Get the Information You Need... Today! Before you start a construction project, it’s important to use concrete scanning to know exactly what is embedded within the concrete structures you will be working with to ensure there are no unexpected conflicts with reinforcing steel, post tensioned cables, or imbedded conduits. Our Concrete Scanning equipment allows you to avoid costly and time-consuming issues, caused by undetected objects in the walls, when you core or cut into existing concrete. 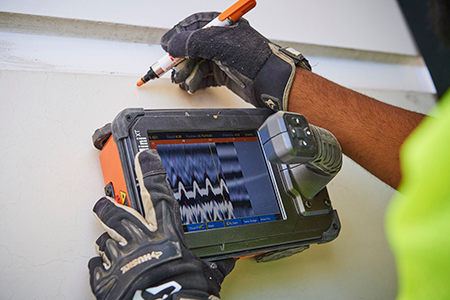 When you schedule a technician to perform a Concrete Scanning at your jobsite, you choose peace of mind knowing that your jobsite has been scanned and analyzed prior to starting work. The lightweight and compact Concrete Scanning equipment is used with ease in otherwise impossible-to-reach areas like under stairways, narrow passages, vertical walls and ceilings. The GPR concrete scanning technology sends radar into the structure as the technician moves the hand-held device over the designated area and records any radar that bounces back. To locate objects such as rebar, conduits and post-tension cables imbedded in concrete, a high frequency GPR system is used. The data can be collected in simple line scans to determine the thickness of concrete or in a grid format which will produce a map of any targets located in the concrete. Using this method we can look at virtual slices in the image to determine the depth of the objects and create a 3D map of the image. Non-Destructive – Since SiteScan uses radar detection methods, sites can be inspected non-intrusively, allowing structures to be preserved and project down-time to be avoided. Without any damage to surrounding structures or the reinforcing steel within concrete, and voids can be identified, located, and mapped. Cost-Effective – With little-to-no downtime, structure damage, facility shutdown, or possibility for worker injury, GPR is a cost-effective solution for identifying subsurface objects and potential problem areas. Efficient – GPR makes it easy to identify safely core locations. 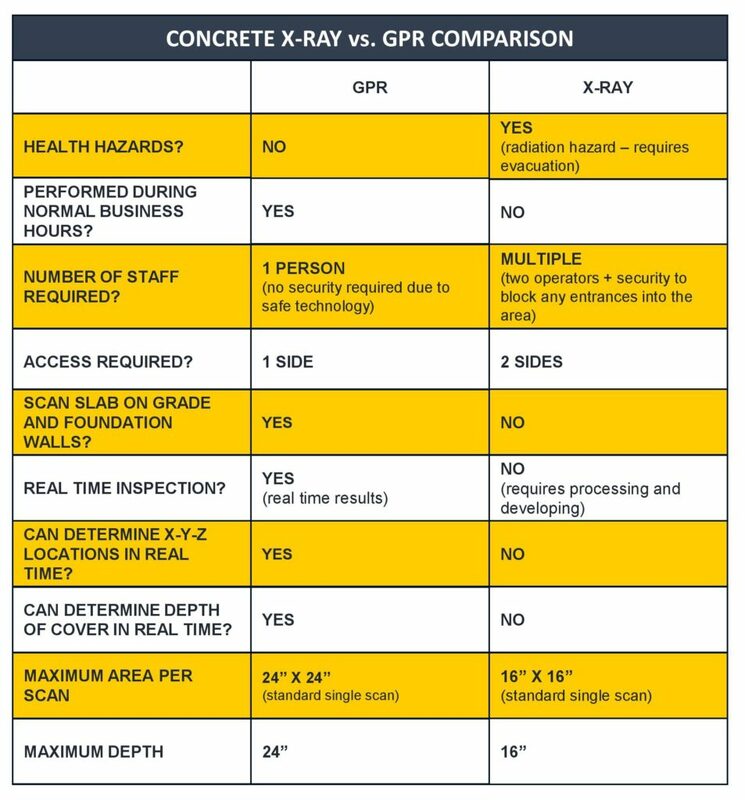 Safe – GPR technology does not produce any radiation during a scan, so workers and bystanders are protected. Assures Quality – GPR will help monitor built-as-designed issues in a structure, such as determining if a concrete slab or wall was constructed as specified and if rebar was placed according to the design plan. For more information on how GPR works, visit our Resources Page. 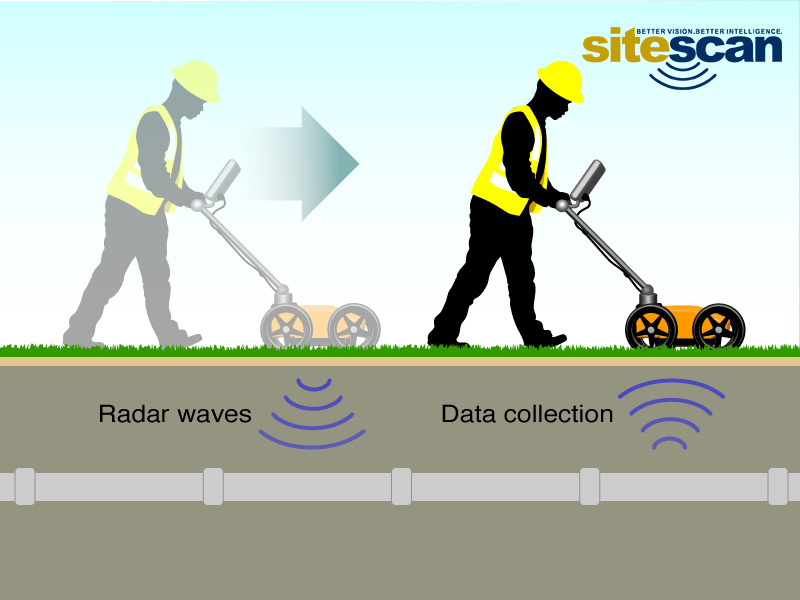 For any unlisted GPR applications, please feel free to contact us to see how SiteScan can help with your subsurface imaging needs. We utilize only the most advanced equipment to ensure you get the detailed results you need. We offer a wide range of frequencies from various antennas, to locate rebar, conduits and post-tension cables in depths up to 30 inches. Ideal for complex areas, the equipment can delineate small targets with superior vertical and horizontal resolution. By leveraging SiteScan’s proprietary application that provides Better Intelligence and instant report delivery capabilities on every jobsite, we deliver the reports to you electronically as soon as the scan is completed. 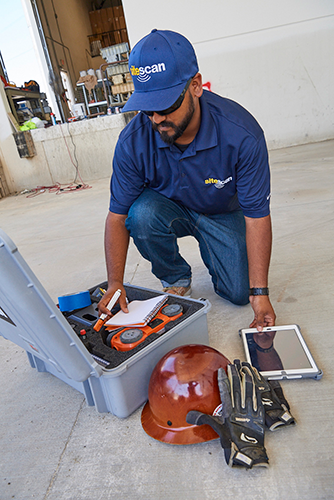 Our technicians collect data for concrete scanning surveys in a grid format, therefore maximizing the area coverage and ensuring the detection of objects within a structure. 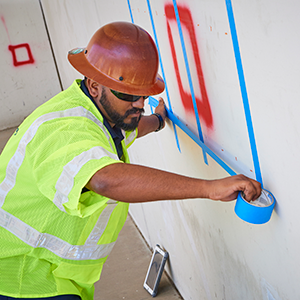 After utilities, reinforcing steel within concrete, and voids are located, our technicians will physically mark them directly on the surface. Non-permanent water-based paint is used where permitted. When paint is not permitted (such as finished decorative surfaces or high traffic customer areas) we use chalk, wax or other materials. Better Vision, Better Intelligence means that the professional staff here at SiteScan will give you results with unparalleled accuracy and insight. No matter the size or scope of your project, we have the field experience, commitment to quality, and technical resources to overcome any challenge and deliver the information you need. We have helped on hundreds of projects for a wide variety of clients with our ground penetrating radar expertise and we are here to help you. Fill out the form or give us a call at 888-445-SCAN. SiteScan is the leading provider of subsurface imaging, concrete scanning and utility locating services in California. Our team of highly experienced certified technicians are experts in the latest technology and can be on site within 24 hours of your call. Why Bother with a Bay Area Concrete Scan?